Our members are industry professionals who are part of a network of contractors with a wide range of experience and a long term standing in the community. The majority of our members are active participants in WSIB/MOL Safety Groups and can provide safety policies to meet or exceed the customer’s standards. It is our goal to provide a safety conscience work force and a safe job site. Our members are willing to discuss the requirements of any project with the customer to satisfy current and future involvement – our goal is always to put the customer first. 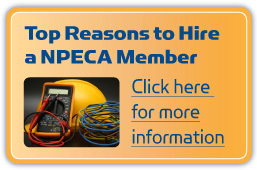 The relationship with the IBEW Local 303 has developed into a partnership over the past years to enable the NPECA contractor to offer options to the customer for a cost effective solution. Our contractors employ members of IBEW Local 303 who live and contribute to the local economy. 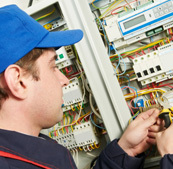 We are able to provide a skilled and licensed work force to meet the needs of any project. Our members spend hours of volunteer time to improve the local industry which in turn provides the customer with industry expertise, a skilled and licensed workforce, safety standards and practises that meet or exceed industry standards. We are committed to training the next generation of journeymen. The Association in partnership with IBEW Local 303 has established a Local Joint Apprenticeship Council to oversee the training of apprentices. In addition to the training required by the Ministry of Advanced Education and Skills Development; the LJAC monitors an extensive set of mandatory courses throughout the apprenticeship program. Our commitment to ongoing training is evident in our monetary support of a training fund. This funding provides training to our employees that range from safety training to skills enhancement to code updates and foreman training. This funding source ensures that the Association members will continue to meet the needs of the industry and government regulation. Our member contractors support the local economy through suppliers, equipment rentals, fleet requirements and office needs. Our members promote improved methods of business practises including fair tendering and fair wage policies.